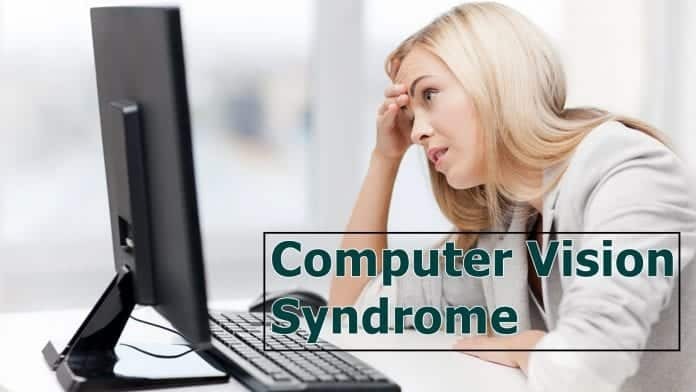 Science What Is Computer Vision Syndrome? With computers and other electronic devices becoming an integral part of our daily lives, many individuals end up watching computer screens, tablet, e-reader, and smartphones for prolonged or extended periods that can put a real strain on one’s eyes. This digital eye strain falls under the heading ‘Computer Vision Syndrome (CVS)’. CVS has become more common these days as almost 50% to 90% of people work on computer screens for more than 3 to 4 hours a day. Not only working adults but even kids are affected due to use of tablets and computers at school if used for prolonged hours. However, CVS is a temporary condition that is caused due to concentrating on computer screen for too long. There are a number of factors that contributes for CVS to develop. This could include lighting in the room, seating position, distance from the screen, glare and reflections on the monitor and surroundings, strain on the muscles of the eye due to work style, poor workstation setup or incorrect use of workstation, decreased blink rate or tear function, uncorrected spectacle power, inappropriate glasses for computer use, angle of the head, job nature and stress. Any one or all of the factors combine to cause an uncomfortable amount of strain on your eyes. Also, when one reaches around 40 years, the ability to concentrate on near and far objects starts going away, which is called as ‘presbyopia’ by eye doctors. If you experience any of the above problems, it is advisable to look into to avoid further damage to your eyes. Use proper lighting that is comfortable on your eyes, and prevents you from staring into glare on the computer screen. Adjust or add window blinds and get an anti-glare screen on your monitor. Position the computer screen to reduce reflections from windows or overhead lights. If the overhead fixtures are too bright, change light bulbs to a full spectrum light or a lower wattage light. Buy yourself a desk lamp with a moveable shade that casts light evenly over your desk. Place your computer at least 20 inches away from your eyes. Adjust the monitor so that it is slightly below your eye level, about 20 to 28 inches away from your face. Adjust the screen settings to where they are comfortable, such as contract polarity, resolution, flicker, brightness, contrast, and font size. Ensure that your chair is comfortable and has support for your neck and back. This will help you avoid neck and shoulder strain commonly associated with CVS. Follow the 20-20-20 rule. Every 20 minutes, spend 20 seconds looking at something 20 feet away, that will give the overused muscles and computer eye strain a necessary time out. Blink often to keep your eyes moist, as blinking washes your eyes in naturally therapeutic tears. Use eye lubricants, if you have dry eyes to keep them moist. Visit your eye doctor regularly for comprehensive eye exams and keep your prescriptions up to date. It could also be time to try a separate set of glasses while in front of a computer. Disclaimer: Please note that this article should not be construed as a medical advice. This article is not intended to replace the recommendations of a medical professional.